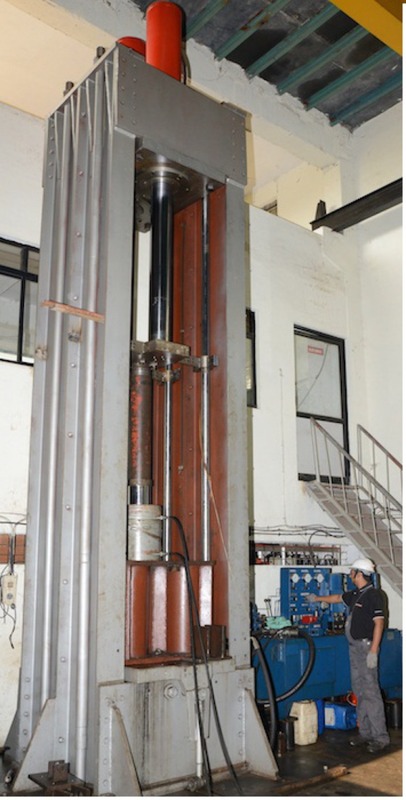 New & Repaired cylinders are load tested on this Hydraulic Load Test Rig by loading the cylinder in the rig to its designed test ratings & then checking the activity of the cylinder to its full stroke several times. This gives complete dynamic & static tests on the cylinder. All manufactured & repaired cylinders undergo thorough dynamic load & pressure test upto the range of 500 Ton for 100% performance & cyclic test for durability. Dynamic Load & pressure tests upto the range of 500 Ton @ 350 Bar pressure. 1. Output force at particular pressure. 2. Internal/ external oil leakage if any. 3. Reliability of welded / threaded joints. 4. Cyclic test done for durability.